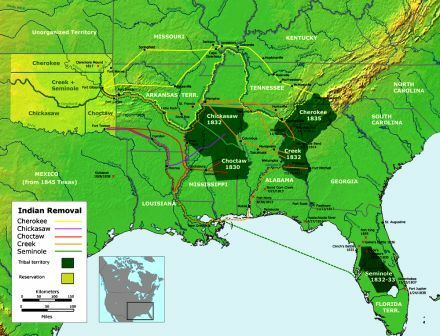 The article provides facts and information via the Trail of Tears Map. Click the following link to learn about the history of the Five Civilised Tribes and how they were eventually removed from their tribal homeland - culminating in the tragic history of the 1000 mile march illustrated on the Trail of Tears Map. 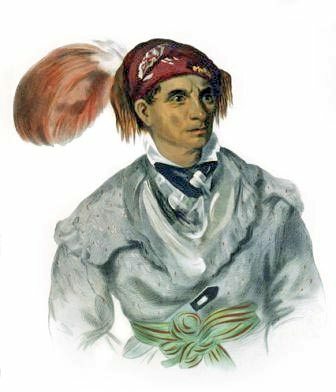 Facts and information about the tragic journey called the "Trail of Tears". 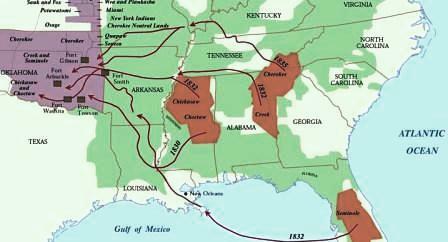 The Trail of Tears Map and the key to the map provides details of the routes taken by the Five Civilised Tribes from their homelands in the Deep South to Oklahoma. 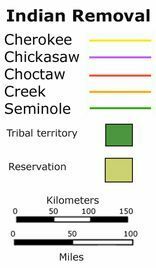 The Five Civilised Tribes consisted of the Cherokee Tribe, the Choctaw tribe, the Creek tribe, the Seminole tribe and the Chickasaw tribe. The Homelands and route of the march for each of these tribes is shown on the key to the Trail of Tears Map. For additional fast information refer to the Trail of Tears Facts. Trail of Tears. Discover the vast selection of pictures and videos of Native Indians. The pictures show the clothing, weapons and decorations that can be used as a really useful educational resource for kids and children of all ages. Our series of videos enable fast access to the images, pics, paintings and pictures together with information and many facts. We hope that this article on Trail of Tears will assist in your studies or homework and that you will enjoy watching the videos featuring many pictures of the Native Indians.